Located by the side of the river Periyar, the Periyar Wildlife Sanctuary is the main attraction of Thekkady. Spread over an area of about 777 sq km with about 360 sq. km of which is thick evergreen forest, the sanctuary was declared a Tiger Reserve in 1978. However, the Periyar Wildlife Sanctuary can also be recognised as one of the natural treasure houses of some of the rare species of flora and fauna. The flora of the park includes over flowering plants, grass species, species of orchids and the only South Indian conifer Podocarpus Wallichianus. Apart from the tigers, the fauna of the park includes wild elephant, gaur, sambar deer, wild boar, Nilgir Tahr, lion tailed macaque, bonnet macaque, Malabar giant squirrel, flying squirrel, tiger, jungle cat, sloth bear, hornbill, stork, woodpecker, kingfisher, raptor, cormorant, grackle, darter, cobra, viper, krait, monitor lizards, frogs, toads, masheer (famous and endangered game fish of India) and otter. Noted for its geo-morphological diversity of wildlife and scenic beauty, the Reserve attracts visitors from all over the world. The splendid artificial lake formed by the Mullaperiyar Dam across the Periyar river adds to the charm of the park. This is the only sanctuary in India where you can have the unique experience of viewing wildlife at close quarters from the safety of a boat on the lake. 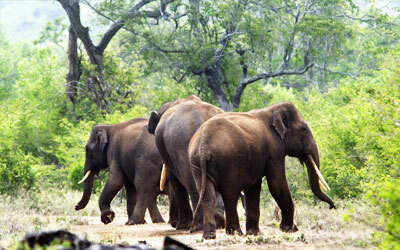 The greatest attraction of Periyar remains the large herds of wild elephants that come down to the lake's edge. This place, Pandikuzhi, is a picturesque spectrum of nature's flora, fauna and gurgling streams. It is the starting point of the Chellarkovil Waterfalls. Sandwiched between Chellarkovil and the Tamil Nadu border, it makes an important excursion point for every tourists visiting Thekkady. Located at a distance of 44 kilometres from Thekkady, Peermede is an important excursion destination one should not miss. 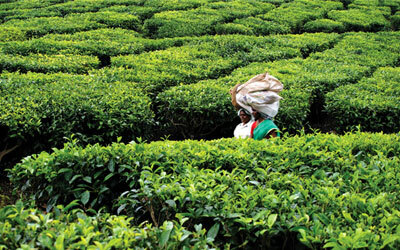 Peermede is situated at an altitude of 915 -1100 m above sea level and is a famous plantation town. The name of the town has been given after Peer Mohammed, a famous Sufi saint who was also a close associate of the erstwhile royal family of Travancore. Peermede is also known for its tea, cardamom, rubber and coffee plantations interspersed with sculptural rocks, meadows and mist-cloaked hilltops. Moreover, Kuttikanam, (a place for adventure tourism and trekking), Thrissanku Hills (a haunt of trekkers and picnickers), Mausoleum of the Sufi saint, the summer palace of the royal family, residence of the Diwan, and the many lofty peaks and streams are some of the other major attractions of this place. Peeremede is a lovely hill station, an ideal retreat in the Western Ghats and a choice break for tourists en route to the Periyar Tiger Reserve. Sprawling gardens of tea, coffee,cardamom, rubber and eucalyptus lying side by side with natural grasslands, pine forests and waterfalls make this an ideal summer resort. The summer palace of Rajas of erstwhile Travancore is today an important monument here. 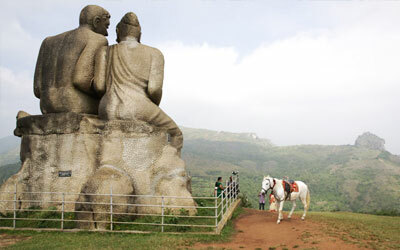 Peeremede and its surroundings are suitable for trekking, cycling and horse riding. 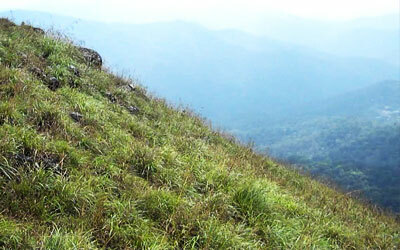 Kuttikanam a place for adventure tourism and trekking is just 3 km from Peeremede. 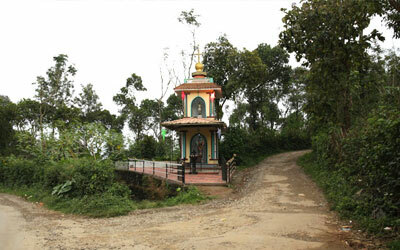 Calvary or Kalvari Mount is both a pilgrim destination and trekking track. The panoramic view of the Idukki Arch Dam from here is sure to enthrall you. The State Forest Department conducts trekking expeditions exploring the wilds. 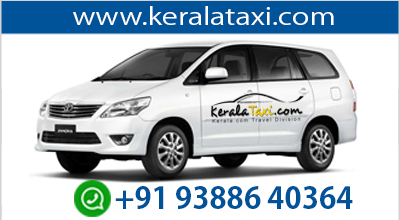 This place is located at just 5 kilometers from the town of Idukki and it lies on the Idukki Kattappana route. It acts as a Christian pilgrimage centre called the Kurisumala. 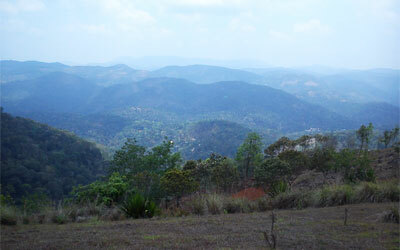 The place also gives great views of Kamakshy and Mariyapuram, the two prominent tribal villages of Thekkady. The best time to visit this location is when the shutters of the dam is open. This place is also best for those who love photography, trekking and so on. The 1000 year old temple dedicated to Kannaki is situated on the top of a hill in Periyar Tiger Reserve. According to the legends, Kannaki was betrayed in this place and she transformed into a divine lady with all her grudge to shower her blessings on her people and hence getting the name Mangaladevi. 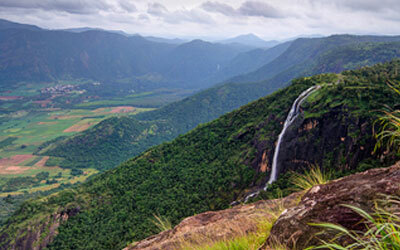 This mountain peak that overlooks eastern slpoes of the Western Ghats and the vast plains of Tamil Nadu. The place owes its name to the tale that the lord Sree Rama, the Hindu mythological god had set his foot on this rock. Also, Kerala's biggest statue, Kuravan & Kurathy treats you here. The rocks, between which the Idukki Arch Dam was built, are named Kuravan & Kurathy, two histrical characters of the local comminity. 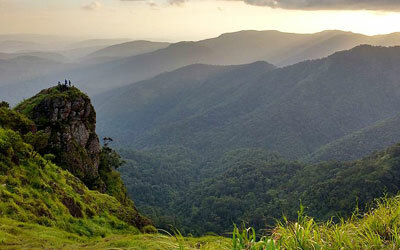 From the top of a cliff here, enjoy the panoramic view of forests and plantations seen as and endless carpet of greenery. It is a very beautiful place just five Kilometer away from Peermade and ten Kilometer away from Vandiperiyar.It looks like a vast stretch of rook spotted with lush green grass.The word parunth in the local language means Eagle and para means rock.It is called Parunthumpara or eagle rock because we can see a large area around like an eagle could see from height. An off-beat trekking spot, at a distance of 4 kilometers from Thekkady, Ottakathalamedu has become popular among the tourists recently. This place is located at an altitude of 1300 meters above sea level. This place offers a breathtaking view of the attractions like Kumily, Periyar Tiger Reserve, Spice gardens as well as some of the villages at Tamil Nadu. With the guidance of Tourist Amenity Centre here, you can explore nature and go adventurous. Ottakathalamedu is an apt location for those who love adventure, biking, photography and nature. Being a newly discovered tourist location, it is not much explored and hence, if planning a trip to this place, do make sure to carry the things that you would need. 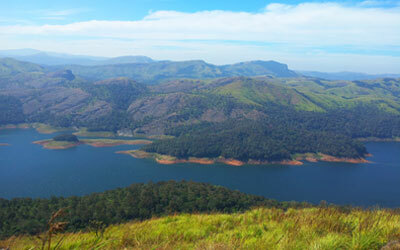 A trekker's paradise and the highest peak in Thekkady. Literally means the 'mountain of the cross', this hill offers a panoramic view of surroundings including a glimpse of Periyar Lake, Kumily town and vast areas of nehbouring Tamil Nadu state. 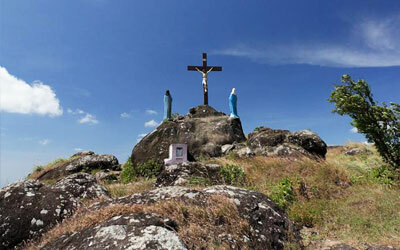 3 km from Vazhikkadavu is this renowned Christian pilgrim centre where hundreds of devotees from far and near converge during the holy week and after, to climb the hill in faith, carrying small wooden crosses. The peaceful Monastry at the top of the hill, the silence of the hills, the cool mountain air and the lush green landscape are all soothing to the soul. On the eastern side of the hill is Muruganmala housing a rock cut temple dedicated to Murugan (son of Lord Shiva). The winding journey to this hill along the Periyar River, offers a stunning view of hills draped in lush greenery. Velvet lawns and rare flora and fauna add to the beauty of Pullumedu. The famous Sree Ayyappa Temple at Sabarimala and the Makara Jyothi illuminations at the shrine are visible from here. On the banks of Periyar River in Kerala lies a beautiful hill station wrapped with the lush greenish nature and mist. 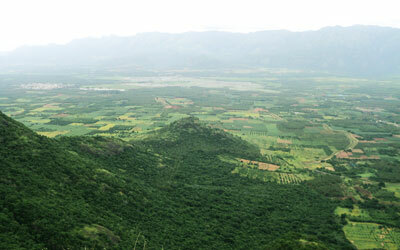 The term 'Pullumedu' means green meadows and coming here you will find the name given to this place is very apt. Be away from the hustles and bustles of the city life and get charged yourself, indulging into the peace and serenity of the nature. 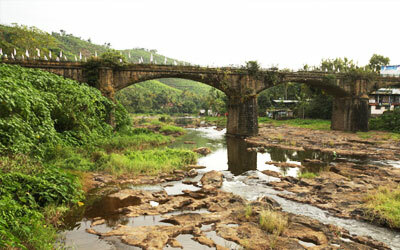 Pullumedu is one of the most wanted tourist destination in Kerala. The untouched beauty of the nature always attracts the tourist to its vicinity. 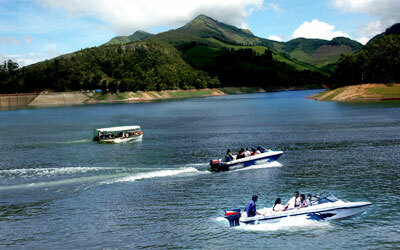 Pullumedu is ideally placed 43 km away from Thekkady and around 26 km from Periyar. 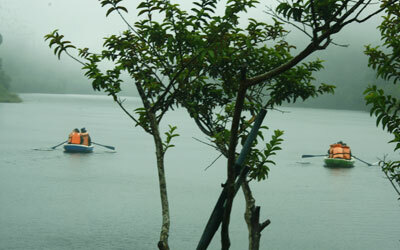 So, those who are planning a trip to Thekkady cannot miss this beautiful destination at any cost. Pullumedu is not only famous for its scenic beauty but also a place famous for its spiritual elements and also a great spot for the academicians too. 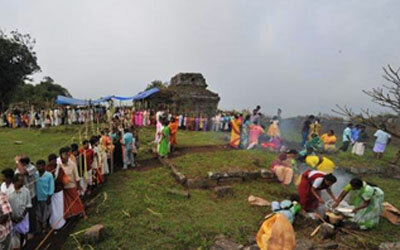 Pullumedu has its links connected to the famous Sabarimala temple and the 'Makarajyothi celebration' there.